St. Louis Cathedral in Jackson Square New Orleans, Louisiana, United States. If you came here looking for commercial cleaning supplies in the New Orleans area, Worldwide Janitor can help you out. For 3 years, we have been selling cleaning supplies across the USA, but haven’t really focused on our local market. Regardless of this, a select few local customers have been enjoying the ease of ordering and free local delivery that we offer. These customers really like the fact that they can place orders 24/7 through our website, that it’s easy to use, and that we show up the next day with their cleaning supplies. Another way we support the local economy here in The Big Easy is by promoting locally manufactured products. Not only do we sell Snee Chemical brand products (locally manufactured in Harahan), but we advertise and sell them nationwide. No other janitorial supplier in New Orleans promotes our local goods in this fashion. We are committed to growing the national footprint of New Orleans through nationwide marketing, and we are locally owned. So what’s the downside you might ask? We have a slightly different business model than most other local janitorial suppliers. First, we are focused on making our website user-friendly, and delivering products to our customers. We do not have a local showroom where you can browse or pickup supplies. Our website is our showroom, and we spend all of our time and money on making it straightforward, error-free, and easy to use. So not having a local pickup location means that products have to be delivered, but the good news is that we’re local, so you can get them fast. In the case of our free local delivery option (for orders over $400), you can get them delivered next day. Some smaller orders might come via UPS, but 90% of our products are fulfilled locally, so they should still arrive in a day or two. We don’t do Net 30 credit accounts. Why? We’re not a financial institution, and there are plenty of lending and credit options available to businesses of all sizes these days. The positive side of this is that we do accept nearly all forms of payment: credit cards, checks, money orders, bitcoin, Paypal, cash…etc. You can even place check orders through our website, and pay when you get the delivery. These payment options enable us to have streamlined operations and keep our costs low for everyone. Lastly, we don’t have any salespeople to waste your time. We DO answer calls and return messages, and we do our best to help our customers with any questions that they have. But we will not call you to sell you supplies you don’t need, and we will not schedule meetings that take up half of your day. We promote efficiency of time and money – and that is where Worldwide Janitor really shines. 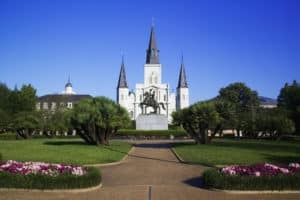 Worldwide Janitor offers a unique service to the people of New Orleans and surrounding areas. We have the absolute best, easiest website, out of any of the local janitorial suppliers in our market. We have some of the best prices out of any of the local janitorial suppliers in our market. And we can get your commercial cleaning supplies delivered to you fast, without you having to leave your office. Give us an opportunity to serve you today by calling 504-509-6250 or placing an order through our website at WorldwideJanitor.com. This entry was posted in Bathroom Maintenance, Disinfectants, FAQ's, Floor Care, General Cleaning, Janitorial. Bookmark the permalink.